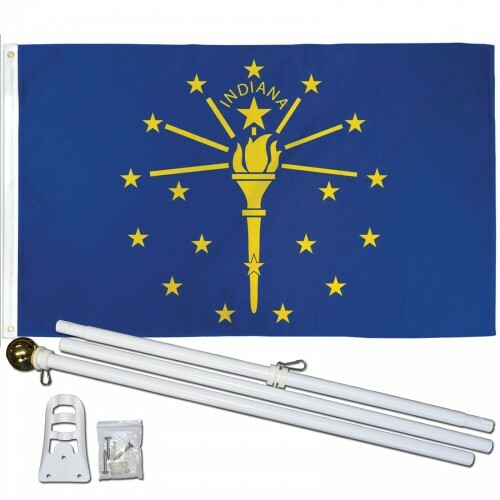 INDIANA STATE 2' X 3' Flag, Pole And Mount. This flag is made from a durable flag material called polyester. The open weave reduces fabric stress and resists high winds. These flags are the best choice if you fly the flag 24/7 and if the flag is flown in an area with high wind speeds. The polyester fabric looks like a coarse cotton, resists fraying and is designed for outdoor use. It also comes with a 5 foot flag pole perfect for outside and inside house banners and flags. The included mounting base makes for easy hanging at a 90 degree angle, OR straight out! This pole can accommodate a flag with 2 grommets or a flag or banner that is hung by a sleeve. Measures 60 in length. Made of wood with a plastic coating for protection against warping. This includes mounting hardware.